With its acclaimed EDAG Light Car concept, the EDAG Group has for the last two years been working on its vision of the electrically driven car of the future. For this year's motor show in Geneva, the developers at the world's leading engineering company have created a fundamentally new mobility concept which will break down barriers between private and other transport systems, and provide the customer with an additional form of mobility. At the core of this integrated mobility solution is the "EDAG Light Car Sharing" vehicle concept, featuring an electrically powered vehicle which everybody will want to hire, but nobody needs to buy. A vehicle which ensures the customer's mobility exactly as and when he needs it, and only needs to be paid for during this period. A vehicle which is accessible to the general public, straightforward to operate, and still makes individual travel in big cities possible. A vehicle which offers the customer perfect mobility without any further obligations once he has finished using it. A vehicle which, through the integration of Internet services, is intelligently linked to the use of other means of transport. The positive response of all groups of society to this exciting concept for electric cars has shown that people are willing to consider new forms of mobility. As a design engineering company, we need to keep a careful eye on social trends, to ensure that, in the long term, we are in a position to develop the right vehicle concepts and technologies for our customers,“ explains Jörg Ohlsen, EDAG Group CEO. Surveys aimed at the younger generation show that values relating to status symbols are being re-defined. For instance, 80 percent of the 18 to 29-year olds asked indicated that there was no real need for them to have a car of their own in town. And an amazing 90 % of 14 to 29-year olds cannot imagine life without a mobile or the Internet - but can envisage life without a car easily enough. "Living for the moment" and "being contactable anywhere" is the credo of the new generation. Last but not least, the increasing traffic problems in the major cities are making us change the way we think on mobility issues; merely discussing alternative, clean drive systems is simply not enough. "With the "EDAG Light Car Sharing", we will be presenting not only a new, powerful and up-to-date vehicle concept at the Geneva Motor Show, but also a new attitude to mobility. A vehicle concept specifically designed for effortlessly getting from A to B, and moreover one which can easily be booked and combined with other means of transport via mobile Internet solutions. Due to the high cost of electric cars today, electric mobility could well take the form of vehicle sharing in the immediate future, and I view vehicles for this purpose as capital goods rather than consumer goods. We invite our customers from the automotive industry and potential market partners to join the discussion on this different form of mobility, and seek out future business models," says Ohlsen. 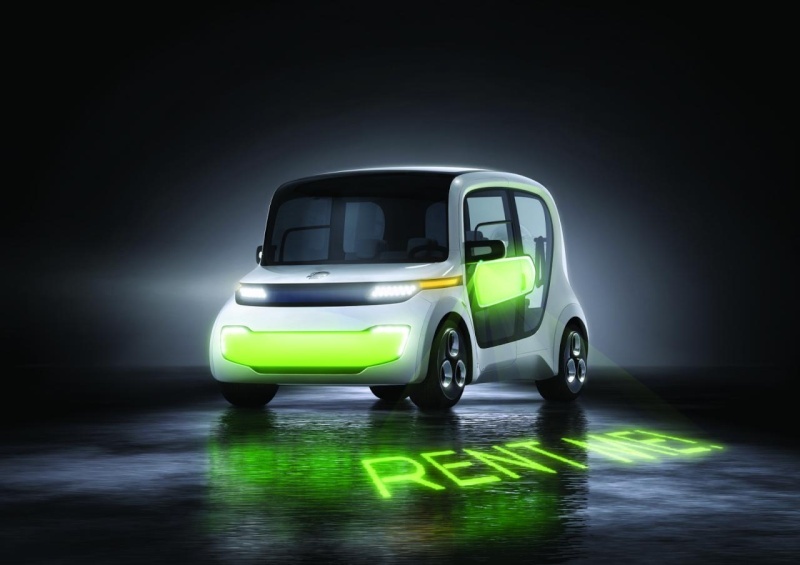 Like the 2009 version of the "EDAG Light Car, the new member of the "Light Car family" communicates with its environment by means of large illuminated surfaces on its plastic body. This time, however, the designers and concept engineers have not just placed the adjustable lighting design in in the spotlight, but also enable the car to clearly indicate its status. The "EDAG Light Car Sharing" shows whether it is available for use or has already been reserved by another customer, as well as giving details of its present range. The vehicle concept uses an electric drive system, with the battery pack in the sandwich floor presented last year, where it is safe from collisions. The Internet, which can already be accessed any time and any place with smartphones, plays a central role for the customer. The operators of future car sharing fleets will use GPS to locate their vehicles and communicate their locations to potential customers. This means that it will be possible to inform the customer which cars are available, and then guide him to the nearest one by means of the navigation system in his smartphone. The booking will be made via Internet, and the customer can then access the vehicle by means of an electronic "Bluetooth key". The share vehicles are to be induction charged: here, with its "intelligent charger", an in-house development, the EDAG Group has created a product which, besides performing the actual charge process, also sends vehicle information via the power supply system and decides which is the ideal time for charging, taking into account the availability of renewable energies and mobility behaviour. Is the vehicle fully charged? How great a range is currently available? When is the car next due to be serviced? This means that the operator receives all relevant information on the status of the vehicle online. One key factor in linking up the vehicle with the infrastructure is a standardised form of communication between vehicle and user. New services such as automated legitimation and the selection of individual tariffs or prices per minute are just a few of the options that become available as a result of the energy provider and vehicle being intelligently linked. This interconnection brings about considerable added value for the entire mobility system. On the one hand, for instance, it gives the energy provider the chance to make use of energy storage and in this way reduce load fluctuations in the grid due to electric cars being connected, while on the other ensuring that there is sufficient resource-saving energy to charge the share vehicles whenever necessary. What is more, the Light Car concept also enables the operator to rent out advertising space on the rear window, which can be used to draw attention to local events, restaurants or shops wherever a car is currently located.Tomorrow's customers will be booking mobility. This means they will enquire about the quickest way to get from A to B, and the operator will offer a complete and suitable solution. If a trip is to take someone out of town, the system will check all transport connections, such as railway or coach, and besides offering a fully complete schedule, will also make the necessary bookings. Tickets will be transmitted and billed via the smartphone. Usage of a share car will be billed by the minute, and the insurance needed for the journey booked and paid for only for as long as the car has actually been used. What does a car need to look like if it is to be used on a temporary basis by lots of different people, often for short trips, in the inner city? EDAG concept developers and designers asked themselves this question, and translated their ideas into the "EDAG Light Car Sharing". Even from the outside, the car is unconventional. With an overall height of 1.9 metres, the vehicle concept makes it easy for customers to get into and out of the car; the higher drag coefficient this causes can be more or less disregarded in town, as can range and maximum speed, which have been set at 100 km and 100 km/h respectively. Fibre composites and lightweight plastic parts are planned for the outer panel parts. Any parts of the EDAG Light Car Sharing which might get dented in city traffic, the bumpers for instance, are fitted with shock-absorbing plastic pads that can be straightened out again. The thinking behind this is that the body concept has been designed to last for a good deal longer than 10 years. Extensive use has been made of a module concept for exterior and interior parts, to permit the rapid exchange of parts which are subject to wear and tear (e.g. cockpit, seats, bumpers, battery and add-on parts). The basis is the refined EDbase platform, which the EDAG Group specially designed last year for the requirements of electric vehicles (purpose design). Besides the two side doors with simple sliding windows, the EDAG - Light Car Sharing, which can seat up to six passengers, also has a rear entry. The generously proportioned twin rear doors provide easy access to the six folding seats inside the car. The seats are in two rows of three, and arranged back-to-back. This centrally arranged seating position is on the same level as the B-pillar, and also has structural properties, whilst at the same time being lighter than conventional, individual seats. "The fact that the seating system folds down is particularly noteworthy, as this maximises the luggage space if the seats are not used," explains Andreas Verwold, project manager. For the actual seating surfaces, which are particularly susceptible to dirt, easy to exchange padded modules are integrated in the seating structure. For this reason, the "EDAG Light Car Sharing“ features neither storage surfaces nor fancy door trims. Aside from the accelerator, brake and steering wheel, the only other control the customer will find is a lever to operate the indicators. There is just one display element which gives rudimentary information such as speed, state of charge, range and navigation. Sensors automatically control the heating, windscreen wipers and lights. Additional functions such as entertainment, Internet access etc. can be booked as optional extras, if desired, or brought into the car and then used there as applications on a mobile device. The focus was on simple, intuitive handling and booking with the help of a smartphone application which is also linked up to other transport providers. Other priorities were that the "EDAG Light Car Sharing" should be“ robust and easy to clean, and wear parts easy to change. Even surfaces in the passenger cabin, and complete seating modules that can be assembled and disassembled using just a few screws are just some of the solutions for the technical implementation of these standards. The concept for a one hundred percent car sharing vehicle was designed as a standardised product. Even from a marketing point of view, it is quite conceivable to dispense with any variants: after all, the customer, who only uses the car for a limited time, values a high recognition factor and intuitive handling more than anything else. This opens up the way to highly productive manufacturing concepts which can enable such fleets to be produced most profitably. The EDAG Group's new, integrated approach to a networked mobility solution defines a new business field for the market serving the automotive industry. And also a change of outlook regarding business models. "Increasingly, future demand is going to be for more mobility solutions rather than just single products. There is great potential in intelligently networking all information and means of individual and public transport via the Internet, especially bearing in mind the fact that there will be more and more customers wishing to purchase mobility when they need it - and only then," explains Jörg Ohlsen. "However, this does mean that, as a consequence, we will have to give some thought not only to the production and marketing of vehicles, but also to the matter of operator models. And, of course, to re-defining vehicle concepts which, as is the case with car sharing vehicles, could represent new markets in the major cities." As a design engineering company, the EDAG Group can offer very real support in the implementation of such concepts. From the development of sturdy electric cars and interfaces with the vehicle, through to the "intelligent charging" system or the planning and construction of production and maintenance facilities. The 125-year history of the automobile has shown that the automotive industry has always been successful whenever it has addressed the mobility desires and needs of society. With its "EDAG Light Car Sharing" concept, the EDAG Group intends to present new prospects for the future development of the automobile.